The drawing is so cool! I love it! p/s: My favorite actress's name is also Linda . So cool!!! Amazing! Love Harry Potter! Really great work, i like it ! It catches perfect the entire feeling of the story, nice picture . This is so simple, yet so perfect. Your portraits look stunning and effortless. You have a real gift. 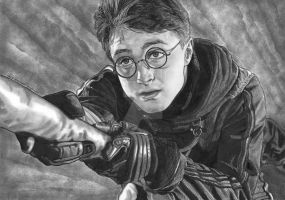 Wow this is so awesome I am a huge fan of Harry Potter and him being my fav character. I love Hedwig too. May I ask if I can print out and frame for my Harry Potter room? Awesome! I love Hedwig aswell! Waaa such a beautiful! Well done!!! Wow!! Amazing work of pencil!! I hope I can make a drawing like this. woaa!! it's awesome !! I adore ! wow what an amazing sketch!!! One of the best sketches I have ever seen !! I love Harry here He just looks so young, and more than a little lost... poor Harry. Amazing I wish I was that talented! Awesome sketch! I could've sworn Harry looks so real here. You're the best drawer in the world !!! I like that your style isn`t too "soft". Cool and emotional! whoa! this is amazing! i love it! Yes, only pencil. I also have put the wallpaper in my desktop. Cute eh? This is amazing, great work! I thought this wasa picture at frist! Very nice I love this a lot! !